The Teutonic Chain Saw Massacre. Chainsaw Zombies Redux is a re-edited version of an ultra-cheap German splatter short made by a bunch of enthusiastic young gore-hounds back in 1999. Quite why anyone would choose to revisit such a project over a decade later is beyond me, but here it is, a whopping six minutes longer as a result but probably not much better for it. The plot—for what it's worth—sees a chainsaw wielding maniac killed and buried in some woods where, a year later, a group of lads decide to pitch their tent to get wasted on beer. One of the guys accidentally cuts his hand on a can, the blood spilling over the maniac's grave, and before you can say 'Wow, what a dumb idea for a movie' the chainsaw killer is up and about chopping up anyone he should encounter. The rest of the film consists of a succession of very bloody, reasonably executed home-made gore effects which prove fun for a while, but eventually get very repetitive, the chainsaw zombie not being all that creative with his power tool dismemberment (I lost count of how many arms get sawn off!). 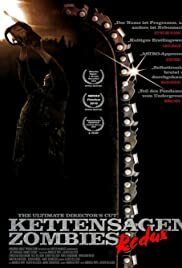 For many, this will prove virtually unwatchable, but fans of independent gore flicks—particularly those who have had a go themselves—should at least get a kick out of the quantity (if not quality) of splatter, and appreciate the dedication required to finish such a film, let alone go back to it ten years later and try and make it better.